Over 300 village artists gathered in Colombo in 1989 to present the Cultural Survival-sponsored Festival of Lanka. Recently in Kurunegala district in Sri Lanka's agrarian heartland a fresh impetus was given to age old institutions by the Cultural Survival Trust of Sri Lanka. The organising of the forthcoming ‘Festival of Lanka' gave the inhabitants of twelve villages something to celebrate, showing that the Festival theme ‘Villagers Go to Town' is more than just a slogan. The institution that inspired this new alliance of tradition and modernity is the Viharaya-Devale Network, which has survived for centuries as the village base for the traditional teaching of Dhamma in Sri Lanka's fabled history. The underlying event that attracted large crowds of villagers at three rural locations was the Kap Hitavima — the solemn pledge for a joint undertaking — in this case the restoration of traditional village culture to its undisputed pre-eminence in society at large. The large and enthusiastic turnout itself was mute testimony to the vitality of village traditions centred on the ancient viharaya-devale axis. The two-day series of events received added colour from the presence of a number of independent observers from England and America, including a British television team. The boiling and sharing of milk-rice were conducted at all three locations in the day and even at night by torchlight not far from the tomb of Sri Lanka's great King Vijaya. On all three occasions, the efficacy of the rituals was indicated by the timely arrival of life sustaining rain showers at the height of each performance, an auspicious coincidence observed by villagers and foreigners alike. 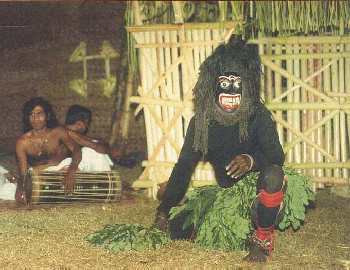 The throb of the beravadana (offering of drum music) heralded the performances of bali (sacrificial invocation), kavi (singing of poems), and 18 vannamas - (dance representing 18 birds and animals), proudly proclaiming the triumphant survival of the ancient spirit of the land's agrarian ancestors Kapurala exorcists plunged into trances before astonished onlookers to cast unwanted spirits out of individuals and out of Sri Lanka entirely in a rite called dehi-kapima (lime cutting). Rituals war-games, such as pora-pol (fighting coconuts), were conducted by skilled teams in a friendly spirited release of human aggression. The fascinating character of the series of festivities was suggested by the number of foreign visitors — not the usual ‘fun in the sun' variety — including ecologists, researchers and journalists, who participated not out of idle curiosity but out of genuine admiration for the invisible wealth of our ancient living culture. Of particular interest was the participation of Edward Goldsmith world famous exponent of environmental causes, one of the founders of the British Green Party. ‘Teddy' Goldsmith came accompanied by a British television team led by Nicholas Claxton, director of the acclaimed film The Price of Progress. Somewhere near Kurunegala British British author and ecologist Edward Goldsmith interviews Sri Lankan philosopher farmer Mudiyanse Tennekoon for television about traditional alternatives to western-style development. Local villagers in Wehera Pokuna Vihare, Nikaweratiya, permit Edward Goldsmith to have a close look as they conduct the ancient kiri uthurana mangala ritual of cooking milk rice to be shared at large. Goldsmith, who donated generously to all three communities, pledged his continuing support in years to come so that these functions may be celebrated annually. He had come especially to meet and interview on-camera Sri Lanka's own Mudiyanse Tennekoon (not the ex-MP), the outspoken philosopher-farmer from the Wanni whom Goldsmith considers to be a logical spokesman for planetary survival through avenues of cultural tradition. 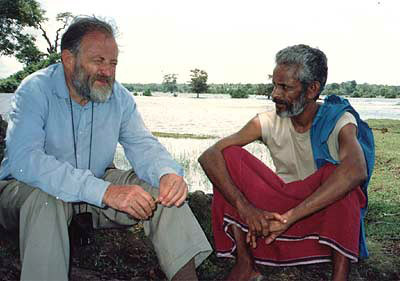 Tennekoon has recently had remarkable success in communicating his vision of social and ecological balance both to thousands of fellow villagers island wide and to influential members of Colombo society, and now to visiting foreign specialists as well. The Agara Uda observances represent a watershed in attitudes shared by simple villagers and society's elite, lending substance to the hope of many that all segments of society — rich and poor, urban and rural, modern and traditional — may at last unite in a common consensus expressive of our ancient culture's determination to survive. Following the successful completion of this phase of the Cultural Survival Trust's people-oriented celebrations, attention will turn to Colombo where the next big rendezvous will occur in December when villagers from Kurunegala and all over Sri Lanka will really ‘go to town', bringing to the big city a panoramic presentation representing every imaginable aspect of our Buddhist, Hindu, Islamic and Christian cultures. A dazzling spectrum of traditional creative artists and other village specialists will coverage upon the Taj Samudra's extensive gardens for four days of live ritual performance for thousands of urban patrons of Sri Lanka's innumerable paramparawas. For four days, here in Colombo as happened recently ancient rites will be performed for mere profit before wealthy foreign tourists, but for Sri Lankans of all beliefs and backgrounds to witness. 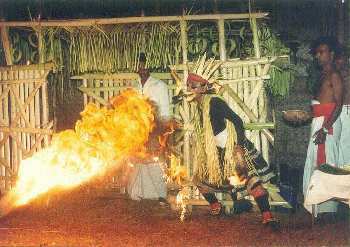 More importantly, the rites performed are considered to be functional, and not merely entertainment, but fully expressive of Lanka's ancient wisdom teachings. Already the national limelight is turning upon a new breed of folk heroes and heroines – artists, devotees and ordinary villagers who have preserved this remarkable range of traditional knowledge with which Sri Lanka sustained its cultural vitality over thousands of years. It is this very knowledge — according to shapers of world opinion like Teddy Goldsmith — that may someday save mankind from the brink of annihilation. Participating temples in Kurunegala district were the Raja Maha Vihara, Wehera Pokuna, Ihalagama, Nikaweratiya, the Raja Maha Vihara Agara Uda, Panduwasnuwara and the Raja Maha Vihara, Weherapla, Bihalpola, Kuliyapitiya.